F Garry Nunn (Vancouver, Edmonton, 2007-10) has signed a one-year contract with Frisk Asker (Norway, GET-Ligaen). Last season, with the San Antonio Rampage (AHL), he had eight goals and 10 assists in 53 games. . . .
F T.J. Foster (Edmonton, 2008-13) has signed a one-year contract with Frisk Asker (Norway, GET-Ligaen). Last season, with the Orlando Solar Bears (ECHL), he had two goals and three assists in 12 games. He also had 23 goals and 32 assists in 50 games with the Norfolk Admirals (ECHL). He led the Admirals in goals, assists and points. . . .
D Daine Todd (Medicine Hat, 2003-08) has signed a one-year contract with Örebro (Sweden, SHL). Last season, he had four goals and 11 assists in 36 games with Luleå (Sweden, SHL). . . .
F Roberts Libsbergs (Seattle, 2012-15) has signed a one-year extension with Dinamo Riga (Latvia, KHL). Last season, he had three goals and four assists in 31 games. #OHL: During the 2016-17 @OHLHockey season, there were 0 head coaching changes. There's been 7 since (ER, GUE, KGN, OTT, OS, SBY, WSR). Ryan McGill, a former WHL player and coach, has left the OHL’s Owen Sound Attack to join the NHL’s Vegas Golden Knights as an assistant coach. McGill, 48, spent two seasons as the Attack’s head coach and was the OHL and CHL coach of the year for 2016-17. With the Golden Knights, he joins head coach Gerard Gallant and fellow assistants Mike Kelly and Ryan Craig. . . . In the WHL, McGill began his coaching career as an assistant with the Edmonton Ice (1996-98), and took over as head coach during the 1997-98 season. . . . He was the head coach of the Kootenay Ice (1998-2002, 2012-15), guiding them to the 2002 Memorial Cup title. He played four seasons (1985-89) in the WHL, splitting that between the Lethbridge Broncos, Swift Current Broncos and Medicine Hat Tigers. 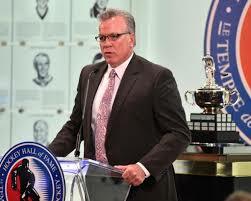 He helped the Tigers to the 1988 Memorial Cup championship. The Lethbridge Hurricanes have added Jeff Hansen as an assistant coach. Hansen, 35, spent the previous four seasons as video coach with the Calgary Hitmen. For the first two of those seasons, Brent Kisio, the Hurricanes’ head coach, was an assistant coach with the Hitmen. . . . Before joining the Hitmen, Hansen was an assistant coach with the AJHL’s Calgary Mustangs. He also has coached in the Alberta Major Midget Hockey League. . . . With the Hurricanes, Hansen fills the vacancy created when Mike Craig left the team in May. He had been on staff through four seasons. . . . The Hurricanes' staff also includes Darcy Wakaluk, a former goaltender coach with the Hitmen. Bruce Gordon played three seasons (1979-82) in the WHL, starting with the Medicine Hat Tigers (71 games) and finishing up with the Saskatoon Blades (112 games). A grinding, tough forward who played hard at home and on the road, he totalled 22 goals, 65 assists and 818 penalty minutes. . . . Gordon, 54, has been incredibly fit. He’s an Ironman triathlete. He lifts, he cycles, he does it all. He was a member of the Saskatoon Police Service, then, at 50, he decided to become a defence lawyer. . . . The other day, things changed when he was diagnosed with Stage 4 pancreatic cancer. . . . Dan Zakreski of CBC News has the story right here. The Kootenay Ice has acquired F Cameron Hausinger, 18, from the Red Deer Rebels for a fourth-round selection in the 2018 WHL bantam draft. . . . The Ice had gotten that fourth-round pick from Lethbridge on Jan. 8 in a deal that had F Zak Zborosky, F Matt Alfaro and a sixth-round pick in 2018 go to the Hurricanes for F Brett Davis, F Colton Kroeker and a 2018 second-round pick. . . . Hausinger, who is from Anchorage, had seven goals and eight assists in 61 games split between Red Deer and the Saskatoon Blades last season. . . . The Blades selected him in the seventh round of the 2014 bantam draft. He had six goals and five assists in 58 games with the Blades in 2015-16. . . . The Blades traded him to Red Deer on Nov. 25 for two draft picks — a seventh-rounder in 2017 and a fifth in 2018. The Kamloops Blazers have yet to sign F Massimo Rizzo, their first pick in the WHL’s 2016 bantam draft. But he hasn’t yet turned them down, either. . . . Marty Hastings of Kamloops This Week reports that “the Blazers brought the heavyweights — (majority) owner Tom Gaglardi, part-owner Shane Doan, general manager Stu MacGregor and head coach Don Hay” to a meeting with Rizzo and his father in Vancouver on Wednesday. . . . Last season, Rizzo put up 84 points in 48 games with the midget prep team at the Burnaby Winter Club. Rizzo also played in a few games with the BCHL’s Penticton Vees. He was pointless in three regular-season games and had one goal in seven playoff games. But he really hit is stride at the Western Cup, where he had a goal and four assists in five games and got some power-play time. 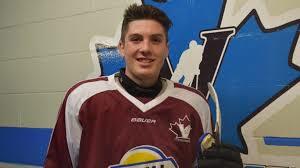 He also had a goal in five games at the RBC Cup. . . . Hastings’ story is right here. The OHL-champion Erie Otters have signed Chris Hartsburg as their new head coach. He takes over from Kris Knoblauch, who now is an assistant coach with the NHL’s Philadelphia Flyers. . . . Hartsburg, a former assistant coach with the WHL’s Everett Silvertips 2009-13), has been the head coach of the USHL’s Lincoln Stars for the past three seasons. . . . He spent 2013-14 as an assistant under Knoblauch with the Otters. . . . From Sault Ste. Marie, Ont., he is the son of former NHL player/coach Craig Hartsburg, who also did a stint (2009-11) as Everett’s head coach. . . . The Otters also signed GM Dave Brown to a three-year extension through 2019-20, and promoted assistant coach B.J. Adams to associate coach. Adams and assistant coach Wes Wolfe were extended through 2019-20. The QMJHL’s Halifax Mooseheads have signed Sylvain Favreau as an assistant coach to work alongside head coach Jim Midgley. Favreau, 39, had been the director of hockey operations and head coach with the CCHL’s Cumberland Grads. From Orleans, Ont., he has been coaching in the CCHL, with Cumberland the Gloucester Rangers, since 2009. D Jordan Wharrie, who has played the past three seasons in the WHL, has decided to play for the BCHL’s Nanaimo Clippers in 2017-18. Wharrie, 20, is from Port Moody, B.C. . . . The Everett Silvertips selected him in the fifth round of the WHL’s 2012 bantam draft. . . . He played seven games with Everett in 2013-14, then spent 2014-15 with the Silvertips. In 2015-16, he played for the Victoria Royals. He split last season between the Brandon Wheat Kings and Vancouver Giants. . . . In 162 regular-season games, he had eight goals and 10 assists. The junior B Creston Valley Thunder Cats of the Kootenay International Junior Hockey League have signed Brad Tobin as their new general manager and head coach. He takes over from Jeff Dubois, who has signed on as assistant GM/assistant coach with the BCHL’s Alberni Valley Bulldogs. . . . Tobin joined the Thundercats a year ago as assistant GM/associate coach. He had been an assistant coach with the BCHL’s Surrey Eagles (2010-16). . . . Creston also promoted assistant coach Jeff Wagner to assistant GM/associate coach. . . . Dubois had been the head coach in Creston for three seasons, going 97-42 with four ties. He is the KIJHL’s reigning coach of the year. Very Happy to see former @WHLPats @adambrooks77 sign with the @MapleLeafs Quality player and quality person! F Adam Brooks, who completed his junior eligibility with the Regina Pats last season, has signed a three-year entry-level contract with the NHL’s Toronto Maple Leafs. 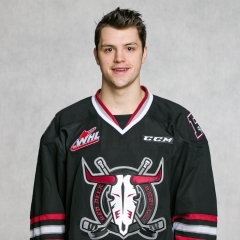 They selected him in the fourth round of the NHL’s 2016 draft. . . . Brooks, who is from Winnipeg, won the WHL scoring title in 2015-16 when he put up 120 points. In 2017-18, he totalled 130 points and finished second to teammate Sam Steele in the scoring race. . . . Brooks finished his WHL career with 335 points, including 119 goals, in 317 regular-season games. He added 49 points, 33 of them assists, in 42 playoff games. The SPHL’s Knoxville Ice Bears have named Jeff Carr as their new head coach. He had been an assistant coach with the Ogden, Utah, Mustangs of the Western States Hockey League for the previous two seasons. . . . Carr replaces Mike Craigen, whose contract wasn’t renewed after the 2016-17 season ended. Craigen had been the Knoxville head coach for seven seasons.